Presentation Day is an Alameda County event usually in February. Members create different kinds of individual presentations (e.g. demonstration, illustrated talk, science, informative, persuasive, interpretive reading) or group presentations (e.g. Share the Fun skits, Cultural Arts performances) and present them to volunteer judges. They get feedback and awards and have the opportunity to move on to area and state-level competition. There are also opportunities for members and adults to volunteer at Presentation Day as room runners, room hosts, and teen and adult evaluators. In 2017, we had 2 members participate. They created a joint presentation about bacon. They got a Gold award and qualified to move on to the next level. 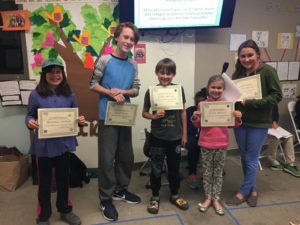 In 2018, we held a 2-day Presentation Day workshop to help kids prepare, and we had 5 members participate, 2 of whom were primary members (ages 5-8). All 3 non-primary members earned a Gold award and 2 of them decided to move on to the Area-level competition. From there, 1 of the members again earned a Gold award and went on to compete at the State Presentation Day. The other member missed it by 1 point!